In 1982, the Himalayan Buddhist Meditation Centre (HBMC) was founded in Kathmandu as the Himalayan Yogic Institute (HYI) by Pam and Karuna Cayton, long-time students of Lama Yeshe and Lama Zopa Rinpoche. Thirty years later, their daughter Arya became the spiritual program coordinator there, bringing her experience and fresh perspective to the city center. It wasn’t my plan to work at the center my parents were involved in starting 30 years ago. I came to Nepal in 2011 with an idea for starting a social/creative business venture and with an undeniable interest in connecting more with the country where I was born and where spiritual practice is encouraged and accessible. The first few months I was here, I was mainly spending time at Kopan, meeting people, traveling, and brainstorming for my business project. After attending the 2011 November course at Kopan, I went to Bodhgaya for Kalachakra, where I stayed at Root Institute for a little over a month. During this time, thousands of people flocked to Bodhgaya and Root Institute was overflowing. I continuously ran into people I didn’t know, but who knew me as “Pam and Karuna’s daughter.” Rather than feeling I was just reaping the benefits of my parents years of involvement, I began developing the wish to serve FPMT and Lama Zopa Rinpoche. In June 2012, Francis Howland, who serves as Nepal regional coordinator, asked me if I would help “HBMC, the FPMT center in Thamel” with some advertising for their programs. I was happy to do this, but I had never heard of HBMC before this, so wasn’t sure exactly what I was getting involved in. After putting some posters up around town, I dropped into the meditation session at the center. Antonio Pascual was leading the class and in his introduction explained that I am the daughter of the people who started the center. Everyone in the class looked over at me and seemed surprised. I was feeling the same way! I had known the center under its former abbreviated name “HYI” and thought it had closed some years ago, so I didn’t even make the connection until that moment that this was the center my parents started. About a month later, when Lama Zopa Rinpoche was in Nepal and just when I was getting busy with other work and starting to see that it isn’t as easy as I imagined to help at a center, Rinpoche asked if I would be the spiritual program coordinator (SPC) at HBMC. I couldn’t say no. Being given this responsibility gives me the confidence that my work at the center is really worth my time and energy. After finishing college and doing the November course for the first time in 2009, I was amazed by how many people my age were there at Kopan. Up until that point, if I went to teachings at a center, I was usually the youngest person in the room and because of this I never really had Dharma friends my age. As my personal connection with Buddhism developed, the need for support from peers became more important. At the 2009 November course, I found it really refreshing and inspiring to meet so many young people from all over the world who had a genuine interest in the Dharma. Since then, I have noticed that many people my age are interested in Buddhism, but they just haven’t met with the right situation to learn more. Now as the current SPC at Himalayan Buddhism Meditation Centre, my wish is to help create a really welcoming and comfortable community space for people of all ages and backgrounds to explore Buddhism. Although I have met many other young people traveling the world in search of more meaning in their lives, it can be challenging to know how to present this ancient philosophy in a contemporary way so that people can understand the benefit it has on their everyday life. On top of this challenge, it is sometimes difficult to find teachers and to make sure we have enough interesting programs to offer, especially with the captivating Himalayas being so accessible. Because this is a new role for me, I also know I have a lot to learn and can always do better. I am really inspired by all the other directors, SPCs, and people who have been tirelessly working for many years to fulfill Rinpoche’s wishes. I now have a little glimpse into this world and see that it is not always easy. I have also found that a lot of learning opportunities pop up, especially ones that require the practice of patience and compassion. I find that it really helps to reflect on the motivation for working at HBMC to see whatever I do there as my practice. This way, I am more mindful and pay closer attention to my actions because the last thing I would want is to create more negative karma from something that is supposed to be benefiting all sentient beings! Although, of course it’s easier said than done, I am learning that a good motivation is really helpful in whatever I try to do. Although I am working on other projects and don’t know how long I will be in Nepal and with the center, there is a lot I wish to accomplish during my time here. I hope that I can help to improve the center so that it can be sustainable and easily passed on from director to director, SPC to SPC. I hope to improve our space by making it more beautiful and comfortable, a refuge and sanctuary from the bustling and noisy streets. From here inner development can follow. 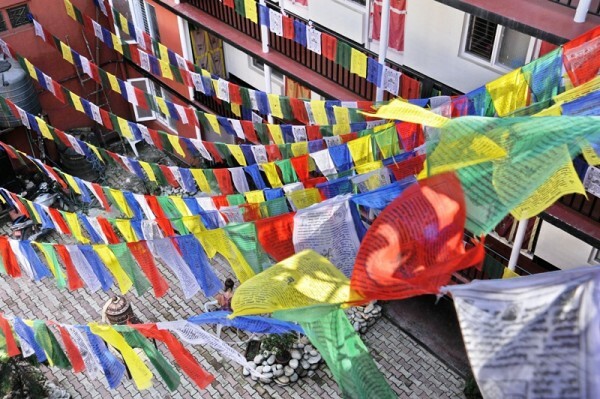 Himalayan Buddhist Meditation Centre is located in the center of Thamel, the bustling tourist hub of Kathmandu. To learn more about the programs available at HBMC, visit www.fpmt-hbmc.org. Read Pam Cayton’s reflections on starting HYI now HBMC. In my mind, one of the beauties of Buddhism is that it offers us a practical training for our mind. It does not say, ‘Bodhicitta is fantastic because Buddha said so!’ Instead, it gives us the methods for developing such an attitude and we can then see for ourselves whether it works or not, whether it is fantastic or not.